We all may want to age gracefully but aging does take a toll on our face in the most bothersome way. Sagging skin and age lines look utterly unappealing and make us self-conscious. While there are myriad of choices to get a facelift, such as Botox, facelift surgery, non-surgical facelifts, etc., a large section of women still look for less expensive options to achieve the best results. An instant facelift is also in pretty high demand to restore a more youthful look. Here comes the importance of a face tape as the affordable solution takes years off your face immediately. In this article, we will talk about how face tape for instant facelift works and how effective it is. What Is A Face Tape? 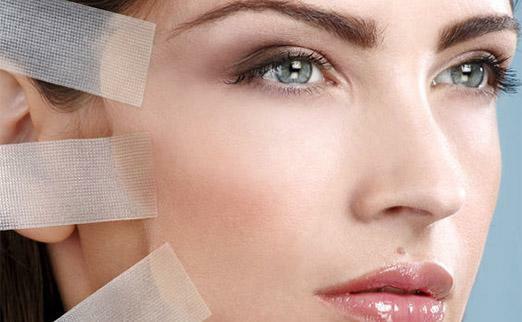 A ‘face tape’ is basically a ‘band-aid solution to a mature face’. As the name reveals, it is nothing but a simple facial ‘tape’ that pulls back and stretches the skin to create an illusion of a tighter face. This non-surgical option gives a mini facelift instantly by smoothing out wrinkles and fine lines in a sagging and aged face. The facelift tape has been very popular among Hollywood celebrities and now, it has also become a fast and easy at-home fix for signs of aging. Why Use Face Tapes For Facelift? A Face Tape is easy to use, extremely cheap and gives instant results. Those, who are not ready to inject chemicals into the skin and want to stay away from surgical procedures, can try this risk-free, at-home solution to look firmer and younger. The tape can work as a perfect alternative to the cosmetic facelift surgery by giving you an instant facelift right before parties and other events. Moreover, you can make your face look fuller and smoother without the risks of potential side effects. How To Use Face Tapes? An instant facelift tape comes with two thick and opaque strips of tape, which may or may not have elastic strings attached to the ends. The strings can be of different colors so that you can hide them easily by your hair. Face tapes are meant for one-time use only. However, you can wear them all day long. Typically, brands sell sets of facelift tape together. Each pack comes with detailed pictorial instructions regarding how to use them and how they work. This ensures safe and effective results. 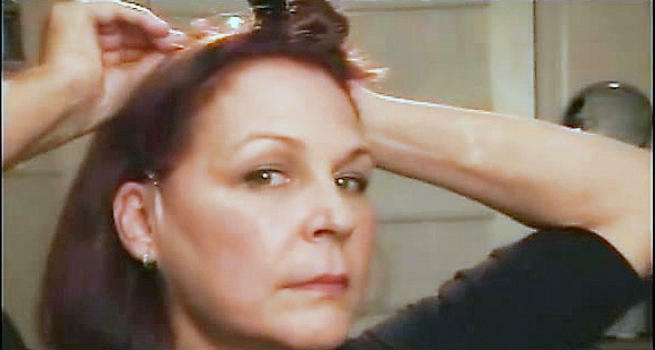 If using a face tape with elastic strings, stick the end of the tape to the skin on the face, right next to your ears. Do this on both sides. Now, pull back the elastic thread and tie it securely at the back of the head so that your skin gets a ‘pulled up’ appearance. Style your hair so that it covers the strings and gives you an instant youthful appearance. If using one without elastic strings, stick one end of the tape to the skin near the ear on your relaxed face. Now, pull back your cheeks with your free hand to get a taut appearance and stick the other end of the tape further up the face. Finally, style the hair properly to keep the tape hidden. This results in a healthier as well as tighter-looking skin. Though the application of face tape seems a little tricky at first, it is actually pretty simple. but you need to practice a bit prior to using it in public. Face tapes can be bought from beauty stores for as little as $30. Many companies like Secret Lift, Bring it up, and Art Hoardings sell facelift tapes that work on the face, neck, and eyes simultaneously. When used correctly, they make dramatic changes by reducing fine lines and wrinkles instantly. They are effective in smoothing out lines near the eyes and firming up the jaw, both of which are difficult to achieve even with makeup. They are really cheaper than branded wrinkle creams and cosmetic facelift surgeries. They come with no chemical involved and the procedure is pure mechanics. It is completely safe and can be practiced any time, anywhere. It works as a temporary solution for women with mature faces. Once you remove the tape, you return to your original state. Applying it properly may not be a smooth affair for anyone and every one. The positioning of the tape can differ based on the shape of the face. It makes the task challenging some times. Hiding it with hair may turn out to be extremely difficult at times. It not only limits your options for hairstyling but also appears tacky and obvious sometimes. Long-term costs of face lift tapes can go up exponentially as they are for one-time use only. Always cleanse your face thoroughly before applying a face tape. It should be performed prior to putting on the makeup and styling the hair. Once you secure the tape on your facial skin, lift the elastic strings over your head and hook them together behind so that the skin look taut and tighter. Do not feel tempted to pull the tape until all those wrinkles and fine lines disappear completely. This may create a fake, weird look. While pulling the elastic strings at the ends of the tape, make sure that it stretches only the skin instead of eyes and mouth. Or else, there will be an unnatural slant to those parts of the face. It can also lead to discomforts like pain, headaches, etc. In a nutshell, a face tape is amazing for an inexpensive non-surgical facelift. If you are looking for a temporary solution that would last for a few hours, it will work real great for you. However, if you want something more permanent, you must skip it.